You feel good when you where a new outfit, right? So why wouldn’t your car feel good with a new set of rims? The global rim producer “Keskin Tuning” wants to represent his products in an impressive and realistic way to show what cars really want in a very humorous manner: stylish rims from Keskin.The paper rims where provided with discount coupons. Promotion’s kick-off was the grand opening of Loop5 shopping centre. As a Keskin store is right next to the shopping centre, customers could cash in the discount immediately. 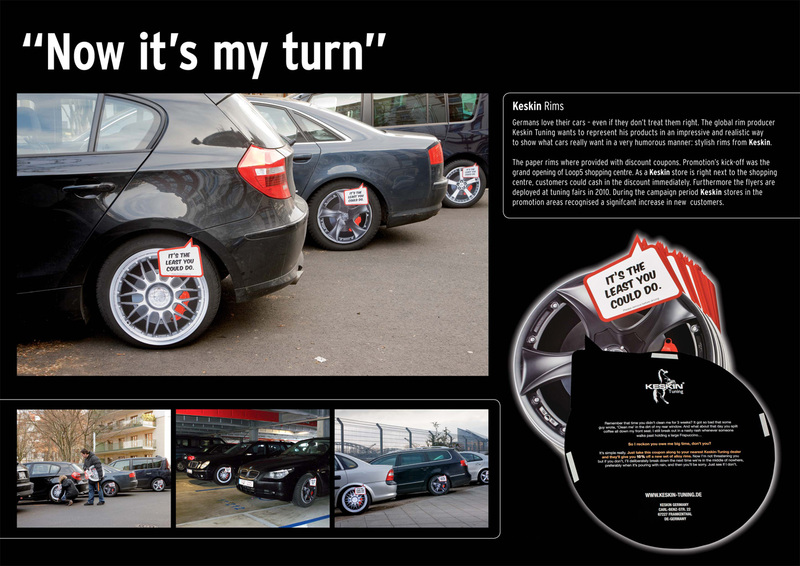 Furthermore the flyers are deployed at tuning fairs in 2010. During the campaign period Keskin stores in the promotion areas recognized a significant increase in new customers. 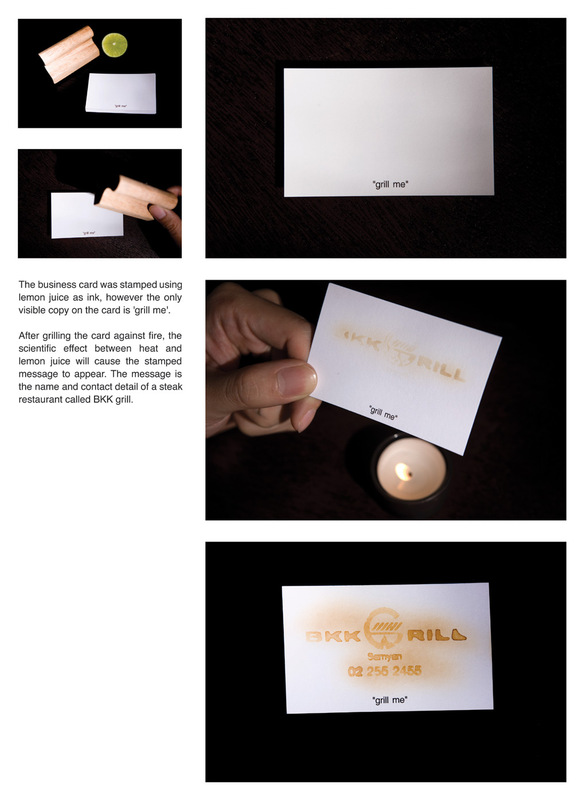 Agency: Saatchi & Saatchi X Frankfurt, Germany. Promotional products are rarely thought to be used for anything more than give aways. Promotional products are used to support a brand image, inspire a moment or feeling, create a reminder, reward employees, and create incentives. These are just a few examples of what promotional products can do. This apple a day calender is a far cry from the typical promotional calendar but it conveys a strong brand message and will be sure to catch a lot of attention. To encourage lovers of fresh seafood to visit Fish Parade, the new restaurant that opened on Rolla Street in Dubai. 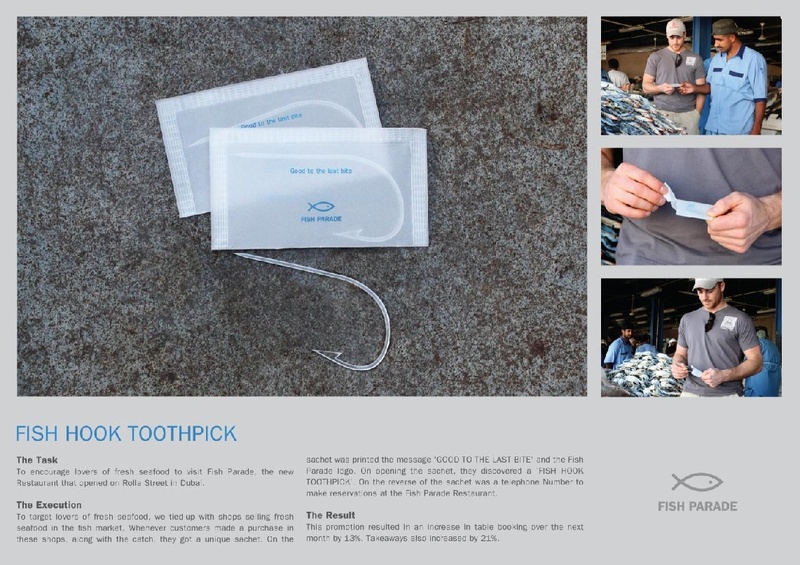 This was a low cost promotion that targeted lovers of fresh seafood at the very source – the fish market. This unique “Fish Hook Toothpick” symbolized both a bait and the culmination of an enjoyable meal. To target lovers of fresh seafood, they tied-up with shops selling fresh seafood in the fish market. Whenever customers made a purchase in these shops, along with the catch, they got a unique sachet. On the sachet was printed the message “Good to the last bite” and the Fish Parade logo. On opening the sachet, they discovered a “Fish Hook Toothpick”. On the reverse of the sachet was a telephone number to make reservations at the Fish Parade Restaurant. This promotion resulted in an increase in table booking over the next month by 13% Takeaways also increased by 21%. Simple promotional products can be used to promote a big cause. In this case its red shoe laces by Nike that have been launched in 13 countries around the world, a campaign timed to coincide with World AIDS Day. The Nike (Product) RED laces are designed to fight AIDS in Africa, with 100% of the profits going to the Global Fund and to Nike football-based programs. Drinking water in the dry region of Northwest China omes predominantly from the small amount of rainwater. Their aim was to raise awareness to colect donations. People use umbrella bags during rainy days. 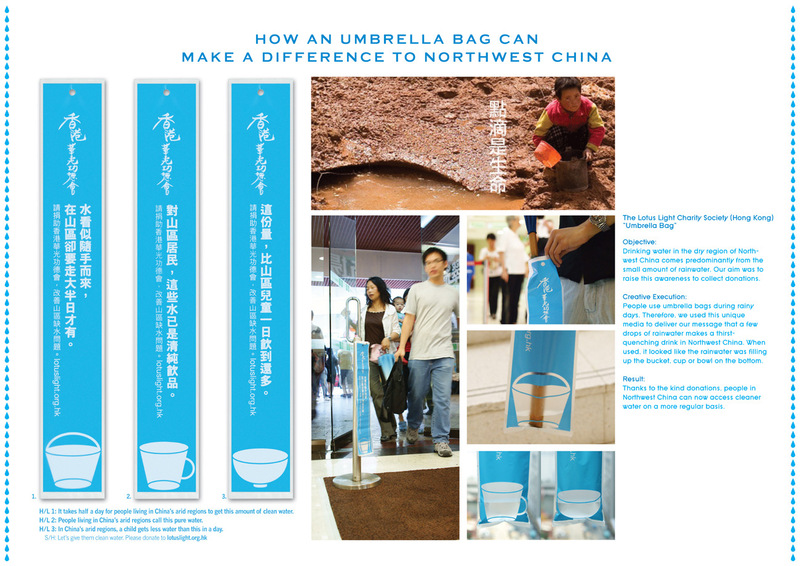 Therefore, they used this unique media to deliver their message that a few drops of rainwater makes a thirstquenching drink in Northwest China. When used, it looked like the rainwater was filling up the bucket, cup or bowl on the bottom. Thanks to the kind donations, people in Northwest China can now access cleaner water on a more regular basis. Agency: Grey Hong Kong, China. In Romania, Guinness is a niche brand, because of its special taste. 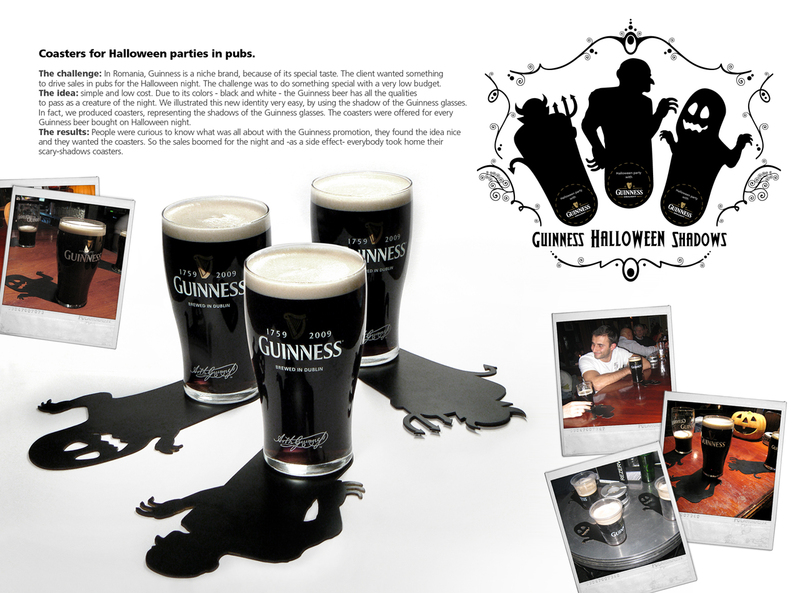 The client wanted something to drive sales in pubs for the Halloween night. The challenge was to do something special with a very low budget. The idea was simple and low cost. Due to its colors – black and white – the Guinness beer has all the qualities to pass as a creature of the night. They illustrated this new identity very easy, by using the shadow of the Guinness glasses. In fact, they produced coasters, representing the shadows of the Guinness glasses. The coasters were offered for every Guinness beer bought on Halloween night. People were curious to know what was all about with the Guinness promotion, they found the idea nice and they wanted the coasters. So the sales boomed for the night and -as a side effect- everybody took home their scary-shadows coasters. Agency: Tempo Advertising Bucharest, Romania.